The public remains divided over government regulation of business. While 45% say regulation is necessary to protect the public interest, about as many (48%) say government regulation of business usually does more harm than good. As in the past, Republicans and Democrats take opposing views of government regulation: 71% of Republicans and Republican-leaning independents think government regulation of business does more harm than good, while just a quarter (25%) think it’s necessary to protect public interest. By contrast, 62% of Democrats and leaners think business regulation is necessary; about a third (31%) think it does more harm than good. There are significant differences in opinion by education and income. A 71% majority of those with postgraduate degrees think business regulation is necessary to protect the public, along with 58% of those with a college degree. More than half (54%) of those with some college education or less say government regulation of business does more harm than good. These educational differences have grown somewhat more pronounced over the last year. More Americans continue to say stricter environmental laws and regulations are worth the cost (59%) than to say they cost too many jobs and hurt the economy (34%). Nearly eight-in-ten Democrats and Democratic leaners (78%), including large majorities of both liberal (82%) and conservative and moderate Democrats (74%), say environmental laws are worth the cost. Among Republicans, however, there are striking ideological differences. Overall, 58% of Republicans say stricter environmental regulations cost too many jobs and hurt the economy, while 35% say they are worth the cost. But by a roughly two-to-one margin (65% vs. 29%) conservative Republicans and leaners are more likely to say stricter environmental laws and regulations cost too many jobs and hurt the economy rather than that they are worth the cost. Moderate and liberal Republicans are more divided on this issue: 46% think environmental regulations cost too many jobs and hurt the economy, 47% say they are worth the cost. Age and education are strongly associated with these views. Younger adults and those with higher levels of education are more likely than older adults and those with less education to say environmental regulations are worth the cost. A 57% majority of Americans say the country needs to continue making changes to give blacks equal rights with whites, while 37% think the country has made the changes needed to give blacks equal rights with whites. More now say the necessary changes have been made to give blacks equal rights than said this earlier this year (37% today, 30% in May). However, that share remains far lower than it was in prior years (for instance, 49% said this in March 2014). As has been the case, a wide majority of blacks (85%) think the country needs to continue to make changes to achieve racial equality, as do a majority of Hispanics (63%). About half of whites (50%) think the country needs to continue to make changes, while 44% think the country has made the needed changes to achieve equality. The partisan divide on this subject remains wide. Roughly three-quarters of Democrats and leaners (76%) say the country needs to continue to make changes to give blacks equal rights with whites, while just 19% think the needed changes have been made. Democratic views are little changed over the course of the last year. By contrast, a 62% majority of Republicans think the necessary changes for racial equality have been made, while about a third (32%) think changes still need to be made. Republicans are now more likely to say the necessary changes have been made than they were earlier this year: This spring, only about half of Republicans (53%) said this. About six-in-ten Americans (63%) now say immigrants strengthen the United States because of their hard work and talents, while 27% say immigrants are a burden on the country because they take jobs, housing and health care. The share of Americans who see immigrants as more of a strength than a burden is now at its highest level in more than twenty years of Pew Research Center surveys. The stark partisan differences in opinion on how immigrants impact the nation are little changed over the course of the last year. Today, an overwhelming share of Democrats and leaners (82%) think immigrants strengthen the country with their hard work and talents, while just 13% say they are a burden. By contrast, Republicans are more divided: Roughly as many (44%) say immigrants are more of a burden on the country because they take jobs, housing and health care as say they strengthen the country because of their hard work and talents (39%). There are key demographic differences within the Republican Party, however. About half of Republicans under the age of 50 say immigrants strength the country (51%), while fewer say they are a burden (35%). For older Republicans, the balance of opinion is the reverse: More say immigrants burden the country (52%) than say they strengthen it (29%). Similarly, Republicans with a college education are more likely to say immigrants strengthen the country than say they burden the U.S. (51% vs. 34%). By contrast, Republicans without a college degree are more likely to say immigrants burden the country because they take jobs, housing and health care (47% vs. 36%). There are only modest demographic differences among Democrats; wide majorities across age and education groups say immigrants strengthen the country because of their hard work and talents. About half of Americans (49%) say that the Islamic religion is no more likely than other religions to encourage violence, while about four-in-ten (41%) say Islam is more likely than others to encourage violence among its believers. Public views have been closely divided on this question for more than a decade, but the belief that Islam encourages violence more than other religions has ticked down to its lowest level since mid-2014. Republicans and Democrats are more polarized than ever on this question: Seven-in-ten Republicans (70%) now think the Islamic religion is more likely than others to encourage violence among its believers; only about a quarter of Democrats (26%) and 39% of independents say the same. Among independents, the views of those who lean toward the Democratic Party are similar to those of Democratic identifiers (26% of both groups say Islam is more likely than other religions to encourage violence). There is a much more pronounced gap between Republican identifiers and Republican-leaning independents: 70% of Republican identifiers think Islam is more likely to encourage violence among its believers, compared with about half (52%) of Republican leaners. There continue to be significant divisions by age, race and education in views of whether Islam encourages violence. Adults under 30 remain far more likely than those who are older to say the Islamic religion is no more likely than others to encourage violence: About two-thirds (65%) say this, compared with only about a quarter (27%) who think Islam encourages violence more than other religions. By contrast, half of those ages 65 and older think the Islamic religion is more likely to encourage violence among its believers; fewer (39%) think this is not the case. Those with some college experience or less education are divided on the relationship between Islam and violence: 43% think the religion is more likely to encourage violence than others, while 46% think it is not. That compares with clear majorities of those with postgraduate (64%) and college (57%) degrees that think the Islamic religion is no more likely than others to encourage violence. Do U.S. efforts abroad help or hurt? A majority of the public (57%) thinks problems in the world would be even worse without U.S. involvement, while about a third (34%) thinks U.S. efforts to solve problems around the world usually end up making things worse. Across most demographic and political groups there are only modest differences in these views. And Republicans and Republican-leaning independents and Democrats and Democratic-leaning independents are about equally likely to say that problems in the world would be worse without American involvement (60% and 57%, respectively). 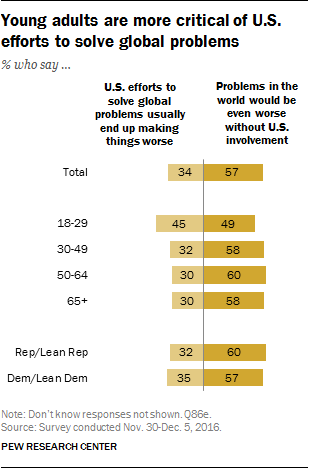 However younger adults are more divided on this question than older Americans: While 49% of those under 30 say problems in the world would be worse without the U.S., roughly as many (45%) think U.S. efforts to solve global problems usually end up making things worse. About half of Americans (53%) think circumstances beyond a person’s control are generally more often to blame if a person is poor, while about a third (34%) say lack of effort on their part is more often to blame. Opinions on this subject vary by gender, education, and party affiliation. By more than two-to-one, women think circumstances beyond a person’s control are more often to blame for poverty than lack of effort (60% vs. 26%). By contrast, men are more divided on the issue: While 46% think circumstances beyond a person’s control are more often to blame, 42% think a lack of effort is more often the reason. Those with higher levels of education are more likely than those with less education to attribute blame for poverty to circumstances beyond a person’s control. Six-in-ten of those with a college degree or more education (60%) say this, compared with about half (51%) of those without a college degree. Democrats overwhelmingly say circumstances beyond a person’s control are more to blame if someone is poor (71% vs. 19% who say lack of effort is more to blame). That compares with a 56% majority of Republicans who think lack of effort is more to blame if a person is poor.